The physical and chemical processes that occur at the scale of individual soil particles dictate the way fluids flow underground over much larger scales. To more accurately predict how plumes of subsurface fluids, such as those harboring contaminants, will spread underground, scientists design numerical models that simulate flow at the pore scale. However, linking these numerical models to tangible experimental data has been challenging. This study is the first of three responses to a challenge given to the pore scale modeling community in 2011 to create models that more accurately predict subsurface flow. Numerical simulations are required not only to model the way fluids move at the pore, or micron, scale, but also to extrapolate up to areas more expansive by several orders of magnitude, such as CO2 sequestration sites, oil and gas reservoirs, or contaminated mining or nuclear disposal sites. This study allowed scientists from multiple institutions to hone their models on experimental data produced in EMSL's microfluidics laboratory, thus improving the predictive power of such models. Scientists gathered at a 2011 EMSL workshop and charted a series of three learning challenges for the modeling community. For each challenge, EMSL scientists ran fluid through experimental micromodels—tiny silicon chips etched with pore networks—then sent the resulting data to numerical modelers. The modelers used the experimental data to train their programs to simulate pore scale flow as accurately as possible. In a grand finale challenge experiment, the modelers put their improved simulations to the test. For this first study, modelers from eight institutions used different simulations to predict the simplest kind of flow: nonreactive transport. In this scenario, only one type of fluid flowed through the chamber and did not chemically react with the pore material. That way researchers could focus on tweaking the physical properties that alter fluid movement, such as the flow rate, size and distribution of pores. The modelers were initially surprised at how inaccurate their simulations were at predicting the way fluid would meander through the micromodels. However, after using the learning experiments to fine-tune their programs, all of them managed to accurately model flow in the different challenge experiments. While the experiments were largely successful, some simulations leaned on the learning experiments more than others. For example, PNNL researchers used a computational fluid dynamics (CFD) simulation, which is based on the topography of the micromodel and separates the flow path into millions of tiny spaces. This "direct" model relied less on the learning experiments to accurately model flow than did pore scale network models, which are programs that don't rely on the overall shape of the micromodel but instead consist of a series of decision points, or rules, that govern the way fluid will move through a pore structure. 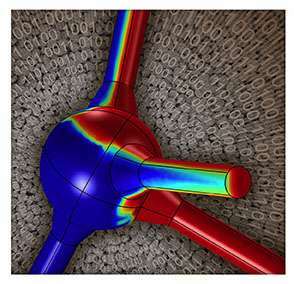 However, an upside of the pore network model is that it was able to run the simulation within minutes, whereas direct methods such as CFD took several days on supercomputers. Now that the researchers have trained their programs to model nonreactive transport, the next challenge on the list is reactive transport, in which solutes within the fluids can react with the pore medium. Finally, the teams will model the complex movements of fluids that don't mix, such as oil and water. This multiphase flow modeling will facilitate predictions of subsurface flow under real-world conditions. More information: Oostrom, M., Mehmani, Y., Romero-Gomez, P., Tang, Y., Liu, H., Yoon, H., Kang, Q., Joekar-Niasar, V., Balhoff, M.T., Dewers, T., Tartakovsky, G.D., Leist, E.A., Hess, N.J., Perkins, W.A., Rakowski, C.L., Richmond, M.C., Serkowski, J.A., Werth, C. J., Valocchi, A.J., Wietsma, T.W., Zhang, C. "Pore-scale and continuum simulations of solute transport micromodel benchmark experiments". Computational Geosciences 18 (2014): 10.1007/s10596-014-9424-0.